Experience the beauty and vastness of the last frontier in New Hampshire. in clean comfortable cabins, join us! Visit northern NH - the Great North Woods region. The rural Great North Woods is filled with nature; moose, bear and large lakes like: Lake Francis, Umbagog, First Connecticut, Second Connecticut and numerous bogs and ponds. With miles ATV and Snowmobile trails to explore you better plan on spending several days or more in New Hampshire's Great North Woods. See our Top Trip Advisor rated Northern NH lodging. Find NH BnB Lodging in the beautiful Great North Woods region, near the Canadian border in Pittsburg, NH. New Hampshire's Internet Magazine offers suggested Great North Woods NH Inns. The headwaters of the Connecticut River – New England’s longest river – are located in Pittsburg, on the Canadian border. Visiting the Connecticut Lakes Region of northern New Hampshire is like taking a step back in time. Fishing, hunting, snowmobiling, birding, sight-seeing and hiking are what brings most visitors to this area. 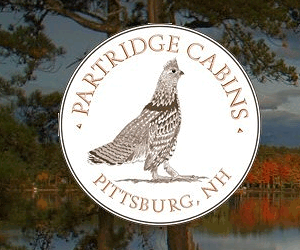 There is also a outstanding lodging available at Partridge Lodge & Cabins. This beautiful lakefront country lodge offers spectacular views of First Connecticut Lake. Moose watching, loon calling and enjoying locally made ice cream cones are favorite past-times. To feature your Great North Woods region northern New Hampshire Inn or Bed and Breakfast, please contact us.